These softwares do a Performance Verification of various types of TDS scopes, all according to the Service Manuals. of the scope and also to change the type of scope e.g. you could change a TD S210 to TDS 220 or a TDS 3014 to TDS 3054 to increrase the bandwidth. is initially locked in the software but can be unlocked for a small fee, just follow the insructions given in the program. Below is a typical screen shot. They all look pretty much the same. The > before PASS occurs when the result is more than 70% of the given limit and off course should the result be outside the limit FAIL will show. Click on anyone below to download. Selecting Full Sequence didn't clear Test Status display. Create New Log File didn't clear Test Status display. SPC couldn't be bypassed in Full Seq. Import/Append Log File didn't work properly and didn't provide relevant Error message in case of missing or corrupt file or folder. New version of embedded GPIB Communicator. New version of embedded Error Log Viewer. Main, GPIB Com and Error Log Viewer added to View Modules. Remove Signals message in Offset Zero test skipped if Full Sequence and SPC was done. Messages in Adjust changed so SPC could be skipped when Adjust was done. Main form caption slightly changed. New version of the embedded GPIB Communicator program. Show Module versions moved to View Menu (from Utilities Menu). Show Module versions appearance slightly changed. Menu Utilities/GPIB Communication renamed to GPIB Communicator. Runtime Error when using illegal characters in Logfile name. Incorrect settings for External Trig test. Contrast adjustment for color scopes (2k) enabled after function has been verified to work. Message saying that a full adjustment is needed to save Contrast adjustments removed since this is not the case for TDS1k/2k. This is the first published version and it supports also B and C models. The Change Scope Type function is only enabled for non letter scopes in this version since I don't have any letter scope to verify it with. For the same reason the Adjust Contrast is only enabled for monochrome scopes. If someone with a letter scope is willing to test the function let me know and can send a version with all functions enabled. Incorrect CG setting in adjustment for TDS210 & TDS220 with F/W 2.0 or higher caused step 46 to fail. Only in full auto. Number of tests shown in message during adjustment wrong for TDS210 & TDS220 with F/W 2.0 or higher. Only in full auto. Message at the end of "Change Type" changed so Adjust Contrast could be selected before a full adjustment. Previous versions were based on the procedures for checking Gain using the early Service Manuals. The Gain check procedure now uses the same way to calculate limits as the latest / last version of the Service Manual. Minor text change on the About form and the link to check for updates changed. If a TDS 2k scope with a lower GPIB address was on the bus the TDS 200 would not be found. Messages in Adjust changed so SPC could be skipped. No warning message about 50 ohm terminators when starting Full Sequence in full Auto. Wrong folder for Logfile was selected after type was changed. Price for locked function (Change Type) changed from $30 to $25. Changes: Main form caption slightly changed. Incorrect settings for External Trig test due to Manual error fixed to match specs rather than the procedure in the manual. Didn't support TDS 340 non A. If a TDS 3k scope with a lower GPIB address was on the bus the TDS 300 would not be found. New version of Error Log Viewer. Runtime error if trying to load a Logfile and no files were saved. Create LogFile and Import/Append LogFile routines changed. New version of embedded TDS Error Log program. Change Type does not support TDS 3064B and none of the C-models. Reading the Error Log or Change Type does not work on scopes with F/W 3.41. That Error Log doesn't work has been confirmed by Tek in a slightly cryptic reply. A work around if you want to change type and already have 3.41 is to temporarily load v3.39 which works. Download 3.39 here. Latest version could be found on Tek's website. All 300 MHz scopes failed BW test. Thanks Bob H for letting me know. Incorrect GPIB command in Adjustment procedure (Auto mode only). Incorrect amplitude settings for Trigger test on B and C models. Incorrect Limit for Sample Rate check on C models. Test Aborted message was not shown in Trig Test when Exit Test was selected. Adjustment procedure changed to work with and verified for 4 ch B-models. Change Type procedure and messages slightly changed. Support for TDS 3064B added on PV and adjust but not Change Type. Ext Trig Connection message at start of Auto mode deleted. 50 ohm terminators reminder message when starting Gain test in Auto mode deleted. 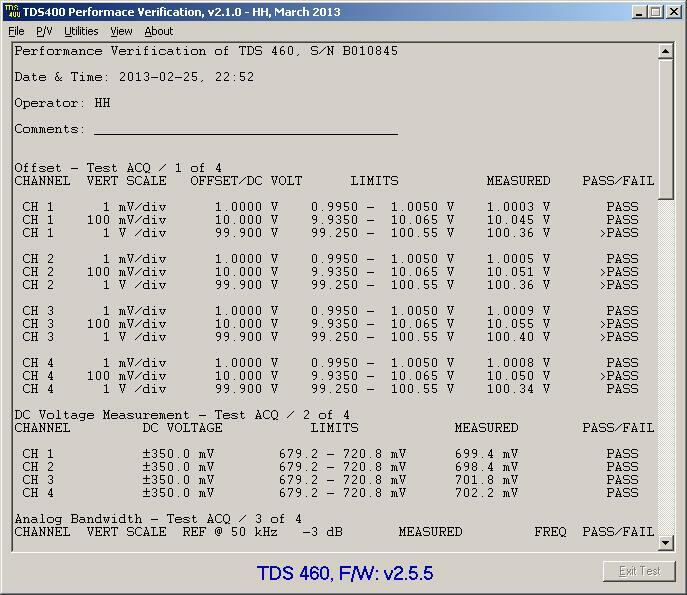 Handling of various SG/TDS combinations changed so two generators could be used for BW and Trig tests on some TDS's. Please, note that this could be considered a beta version since I have only been able to test it fully on a TDS 3014 changed to TDS 3054. So there may still be some bugs or issues I haven't detected yet. Use the email link at the bottom of this page to report whatever you find. and Immediate Measurements (not shown on screen) didn't have the same source channel. This must be a F/W bug in the scope. Tested scope was a 420A with F/W 1.0.2. Long-term sample rate and delay time check didn't work properly on A-models (could not blame the scope there). Amplitude setting of AUX Trig Sens test failed when the system mode was full Auto (only applicable to my own Cal System). Acq mode of the first test of Offset changed from Hi Res to Average. Show Test Parameters moved to View Menu (from Utilities Menu). Still problems with Analog Bandwidth check on some scopes. The scope will randomly send incorrect P-P values causing the test to fail. The problem always occured on CH2 to CH4. happen but only on some scopes. A TDS784A would fail while a TDS544A wouldn't. Firmware bug in the scope ?? Timeout for SPC could somtimes be to short (300s) causing a Time Out message. It was changed to 1000s (16.67 minutes) which is the only available as next higher..
A timing issue would cause Analog Bandwidth check to fail. Thanks to Bob H for letting me know. No warning and no change of SG if an SG5030 was used on a 1GHz scope resulting in the system trying to set the SG5030 to frequencies higher than 550 MHz. When in Full Auto mode (only applicable to my own Cal System) the SetSG command didn't use the system comp values in BW check if a R&S SME03 was used for SG. The link in About to check for updates changed from the index page to the this page. 1.0.0 This is the first published version. Since it supports a large range of instruments I have not been able to test and verify every configuration. Hopefully there won't be many errors but I would like to know of any bugs or preferred changes. Uninstall any previuos version before installing this one or extract the *.exe file from the *.CAB file and replace your current file. You must have a NI GPIB card with the correct drivers installed. Find and download National Instruments GPIB card drivers here. It is expected to work on any PC/win OS (not 3.1) with a correctly installed and working NI card/adapter.